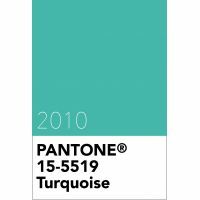 Pantone announced the Pantone colour of the year for 2010 as Pantone 15-5519 Turquoise. An inviting, luminous hue that combined the serene qualities of blue and the invigorating aspects of green into a vivid Turquoise. Turquoise inspires thoughts of tropical waters and an escape from everyday life, to restore a sense of wellbeing. In many cultures it is believed that turquoise is a protective talisman and a colour of faith and truth, inspired by water and sky. Whether envisioned as a tranquil ocean surrounding a tropical island or a protective stone warding off evil spirits, Pantone Turquoise is a colour that most people respond to positively. It is universally flattering, has appeal for both men and women, and translates easily to fashion and interiors. Pantone 15-5519 Turquoise is from the Pantone Fashion, Home + Interiors colour library.